The earth�s oceans were once the hunting ground of real sea monsters that could have frightened even the most fearsome Hollywood creations. This fascinating new poster provides 22 striking and scientifically accurate illustrations of the most well known. 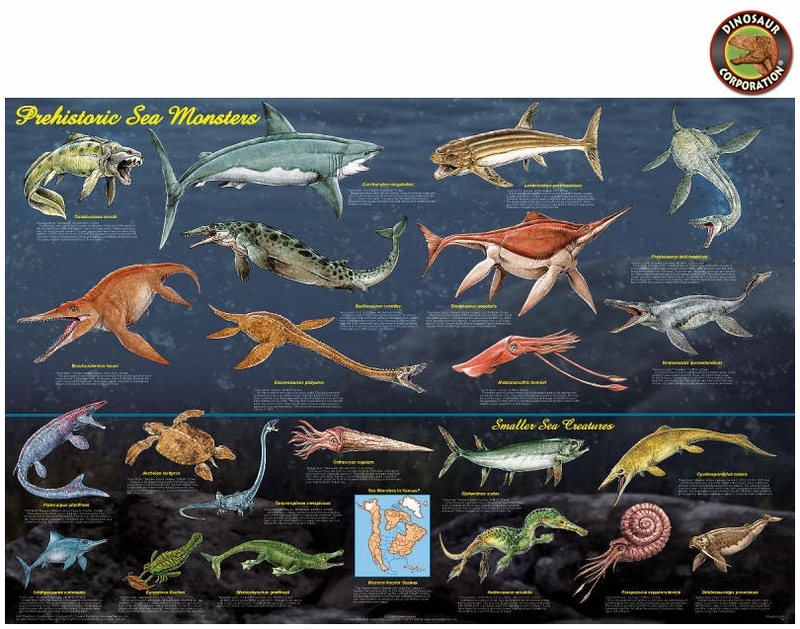 These aquatic monsters include the terrifying Dunkleosteus, a giant fanged fish more than 33 feet long, with jaws like a primitive slicing machine for devouring armored prey; the 66-foot-long Plesiosaurus, a ferocious long-necked aquatic reptile that was the apex predator of the Jurassic oceans; and the massive Megalodon, the largest-known shark, at least three times longer and larger than today�s great white shark. Surprisingly, fossils for many of these aquatic species have been found in central and western North America. That�s because 148 million years ago, this area was covered with a vast inland sea. It dried up about 70 million years ago, leaving behind many spectacular fossils. This poster contains a map of this sea and the above explanation.